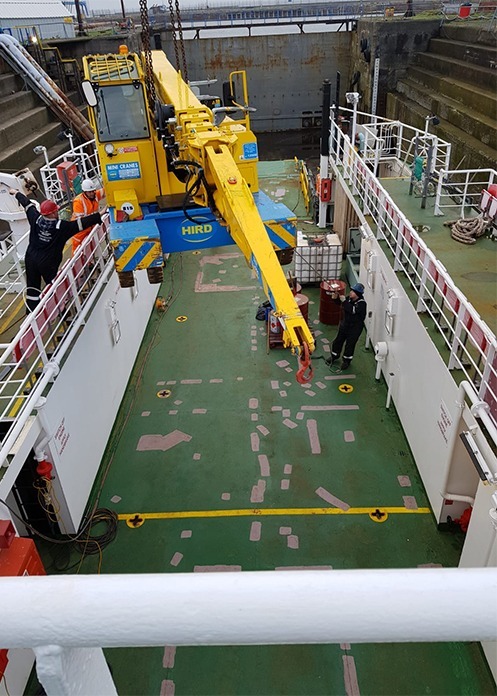 A pick and carry crane supplied by Hird has been used to lift out and replace a major component on board a car ferry. The lifting solution proved to be a success after all other possible methods for completing the maintenance task were found to be impractical. 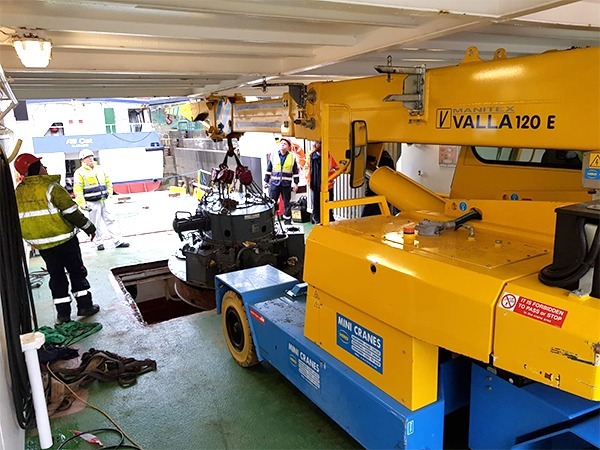 The Valla 120E mini crane was lifted on to the Scottish islands ferry using a mobile crane. Its compact design yet excellent lifting capacity was found to be ideal to allow the lift to be carried out in a highly confined space. The engineering company carrying out the repairs had considered a range of other options to carry out the lift, including using a gantry, a mobile crane, and load-bearing scaffold. But all methods came up short. It was only when using a pick and carry crane was considered that a practical lifting plan could be put in place. 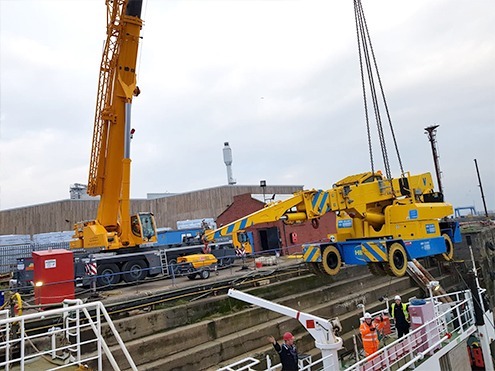 Carl Cooper, from Hird, said: “The proximity of an upper deck meant the area around the access point to the rudder control system in the engine compartment had very little headroom for lifting equipment. “As an industrial pick and carry crane, the Valla 120E is designed to be operated in such confined spaces. The electric-powered Valla 120E mini crane was lifted across to the boat using mobile crane. 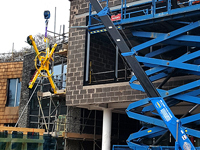 The pick and carry crane’s gross weight is 14 tonnes, yet is just 2100mm wide, is 4300mm long and is just 2320mm high, allowing it to be operated in spaces where headroom is limited. 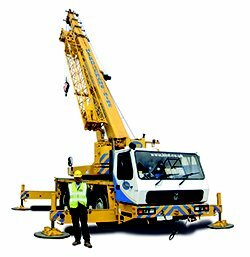 Its four-section hydraulic boom gives delivers a maximum radius of 7 metres, at which point it can still life 1.9 tonnes, and a maximum tip height of over 10 metres. The crane also has a hydraulic luffing jib. This adds an additional three metres of boom length and an ability to sweep through 40 degrees to reach over obstacles in areas where headroom is limited. As well as being suitable for marine and shipping applications, Valla pick and carry cranes are in demand for factory maintenance, supporting manufacturing processes, steel erection, glass installation and demolition. 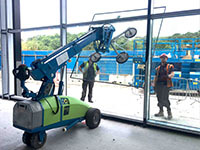 For more information about Valla pick and carry crane hire, or to discuss contract lifting options to safely and effectively carry out all types of lifts, contact Hird. 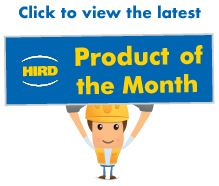 Also talk to Hird, which is the UK and Ireland authorised dealer for Manitex Valla Cranes, about options to buy new and used Valla cranes. 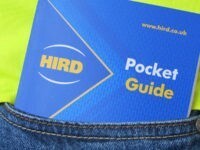 All Hird services, which also include contract lifting services, spider crane hire and powered access hire, are available nationally through the company’s three regional operating hubs.